Restore and protect your metabolic efficiency with natural, safe and comfortable DIETLESS WEIGHT LOSS! Sick of losing a few pounds only to regain more? Start here to find weight loss help available on this site. A healthy diet plan is a weight loss system that takes you from losing your first ounce to maintaining your ideal weight for life without transforming you into a fire breathing Dietzilla. The best weight loss program for you is the one you will do. One that does not interfere with your life. Take up time, require effort and has a MISERY INDEX OF ZERO. The best weight loss program is one that WORKS. Crash diets cause cravings, deprivation, binging and emotional rebellion. How healthy is that? Worse, dieting is proven to be one of the primary causes of obesity. Calorie deprivation attacks your body’s will to survive. Your body responds by conserving energy (not burning calories). Storing fat and burning carbohydrates and water. Your metabolism slows and becomes less efficient. You lose muscle tissue as well as fat. Your percentage of body fat increases due to muscle loss even though the scale shows water weight reduction. The result is less muscle to burn fat and you regain 5-25% more weight with each diet. Chronic dieting leaves you emotionally and physically drained. Dieting generates frustration that causes binging and eventual failure. Popular fad diet plans are the gateway diets to Diet Disease. Diet Disease is a continuous cycle of losing and regaining weight. Once you get on this diet merry-go-round it’s hard to get off. It starts with only a few pounds to lose. You diet and regain more weight than you lost. Soon you're overweight. Diet and regain again. Now you're obese. Diet, regain. And you are morbidly obese. That's Diet Disease. It's gradual. Sneaks up on you and IT'S DEVASTATING! Popular diet plans, pollyanna nutrition, magic pills, gizmos and gadgets do not deliver lasting weight loss results. If miracle cures worked America wouldn’t be knee deep in cellulite. You wouldn’t need to lose weight because one of the 800 diets you already tried would have worked. You have been lied to, mislead and deceived. You don’t have to eat like a goat to lose weight. There is a better way. The best weight loss program is a healthy diet plan that doesn’t intrude on your life. A foolproof weight loss plan. Foolproof Weight Loss is the cumulative result of over 30 years research, studies, surveys, questionnaires, focus groups and one on one, face to face interviews with literally thousands of people who lost weight. They revealed what worked for them, what didn’t and why. Foolproof Weight Loss is the healthy diet plan you will do because it doesn't drive you crazy. Doesn't require the diet diva routine or turn you into a fire-breathing Dietzilla. Imagine a healthy diet plan that allows you to eat the exact same food you eat now. Same pizza, burgers, fries, soda, beer, chocolate and barbecue. Here’s the best part. No one notices you’re losing weight because you’re not eating any differently. Nobody watching you. No pressure. 100% stealth weight loss. Total weight loss anonymity. Your weight loss remains a secret until it becomes obvious and your new figure gives your secret away. Foolproof Weight Loss works because it requires so little of your time and effort to succeed. It works for every healthy person when followed. And unlike most diets, Foolproof Weight Loss is 100% DOABLE. No starvation, gimmicks, gizmos or grueling exercise required. People ask me why I give so much valuable information away for free. The answer is simple. To demonstrate my knowledge so you have enough confidence in me to rely on the information I provide. To offer people a genuine opportunity to lose weight and keep it off. To prove that weight loss is not hard or difficult. Nor is permanent weight loss beyond the reach of any healthy person seeking its rewards. To pay back all the successful weight losers who confided in me and shared the specifics of their weight loss experience and success. I offer you the free information on my web site because I want you to benefit from it. I sincerely want you to reach your ideal weight, move in and live there for your lifetime. If you’re exhausted from a constant barrage of weight loss confusion and useless information, your search ends here. The information on this web site is based on accepted science and the specific actions and psychology thousands of people used to successfully lose weight. No hype. No puffery. Just the facts. This is where you will find the critical information necessary to lose weight, keep it off and live your life without weight issues. Portion Perversion -- The real reasons two-thirds of America is overweight, portion size. This section is the science of how to leave a little to lose a lot. 20 Facts On Obesity -- Read the feature, A Healthy Diet Plan With a Misery Index of Zero Is What Overweight People Really Want, and see if you agree. 28 Day Diet Diary -- See how I maintain my 127 pounds eating burgers, fries, pie, Black Forest Cake, BBQ, beer, Dr Pepper, pizza, cookies, ice cream and a daily dose of chocolate. No diet or health food required. All explained and analyzed in detail. 110 Quick Weight Loss Tips -- Learn how to eat what you want and stop when full. It's easy once you know how. Review this section for tips that produce diet free weight loss instantly. Best Exercise -- Good news. Strenuous, grueling exercise is absolutely unnecessary for weight loss. As a matter of fact, it's clinically proven extreme exercise INCREASES APPETITE. Every doctor I've spoken to says the gladiator type workouts can be extremely dangerous for an overweight person. For the most productive exercises and tons of calorie burning options, check out this section. Facts On Obesity Survey -- Learn what really works for weight loss, what doesn't and why from 5,000 diet veterans who experienced it. The result is a do's and don'ts check list to certain and lasting weight loss. Analysis, comparisons, hot tips and conclusions included. This is a comprehensive and in-depth survey that will help anyone who wants to lose weight permanently. An absolute must read for any clinical researcher or health care professional. Take the survey yourself and compare your answers to the 5,000 dieters who participated in the original survey. Sandwich Solutions -- Does an Italian Beef Sandwich, Chicago Hot Dog or a Texas Chili Cheeseburger sound like diet food to you? Sprout and leek on rice bread NOT ALLOWED. Real Food Recipes -- Comfort food that wraps its arms around you. Chicken & Dumplings, Cajun Cabbage Rolls (no rice), Green Chili Stew and Tomato Butter Meatloaf and a lot more DIET-FREE recipes. You don't have to eat like a goat to lose weight. Cooking tips, recipes, hints and tips included. Survey Results -- What's required for a diet to work? Five hundred ten (510) weight losers reveal what's necessary for a weight loss effort to succeed. 10 Reasons Why Your Diet Fails -- When you see these startling facts, diets will no longer control your life. Find out how hidden calories and factors beyond your control make successful dieting next to impossible. A Healthy Diet Plan As Sensible As It Is Effective -- I reveal the easiest, safest, natural, most effortless and sensible weight loss diet plan on Earth. 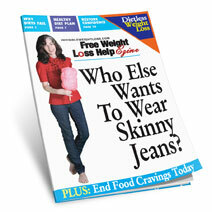 If you think I'm exaggerating, download your Free Weight Loss Help Ezine and you can DECIDE FOR YOURSELF. You can also begin losing weight sensibly at your next meal. How to End Your Food Cravings Today -- Many diets end because cravings for forbidden foods become intolerable. My clients rarely experience food cravings. Once you understand the five causes of cravings, it's easy to eliminate them. How to Restore Self-Confidence So You Can Succeed -- The biggest obstacle I've faced in helping people lose weight is the absence of self-confidence. After failing at numerous diets, gaining more after each diet, confidence is ravaged. I give you an easy way to revitalize confidence so you can lose weight and get on with your life. 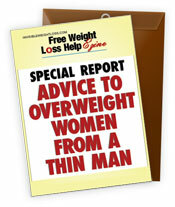 Advice to Overweight Women From a Thin Man is an essay about a real experience I had with a weight loss client. Her physician, priest, psychologist and myself failed her miserably. When all seemed lost and a controlled environment with constant supervision seemed inevitable, a "miracle" happened. It occurred right before my eyes. I was recording "the appointment" because of the critical nature of the session and captured the moment exactly as it happened. Read this brief three page transcript and your faith will be renewed in humanity. I've seen the effects this essay has on people. Magic words that have changed people's lives for the better. If you're hurting for any reason at all, this unbelievable story will perk you up and alter your perception of life itself. Frankly, I do not know, nor am I aware of, any free weight loss help available on the Internet or anywhere else that offers you this level of proven, practical and effective free weight loss help. This is not mere fluff to build a mailing list like many freebies, but real genuine weight loss hints, tips, cheats and shortcuts that get extraordinary results when applied. You can subscribe with the confidence your information will never be shared or sold.